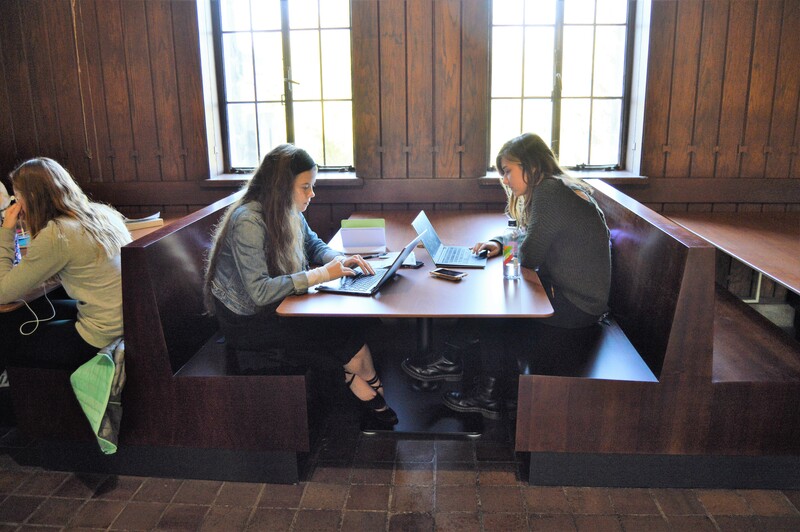 Two students study in the new booths in Jordan Hall. Photo by Regan Koster. The Student Government Association Student Initiative Board has installed several new pieces of furniture in the hallways and landings of Jordan Hall. This project was funded through the University Capital Budgeting process. The updated furniture comes two years after students expressed a desire for furniture that was more accessible and included amenities like power sources. As of last week, the old sunken-in couches and low, round coffee tables have been replaced. After SGA’s Capital Budgeting request was accepted, SGA members were able to decide on and purchase this new furniture in conjunction with some university administrators. Lacheta said that students had requested to see more long-term study spaces in Jordan. Lacheta also said that the old furniture is being repurposed in other areas on campus, including the Dean’s office and the CHASE office. Students who frequent Jordan Hall, either for classes or to utilize the abundant soft study spaces, had varying opinions on the change to more long-term spaces, which features higher tables and wooden booths. “It’s totally changed the vibe of these study spaces,” senior English major Alex Jensen said. Jensen has two classes in Jordan each week and is more partial to the comfy feel of the old furnishings. Jordan Hall was built in 1928 with a Collegiate Gothic architectural style in mind, making it one of the three original campus buildings, along with Atherton Union and Hinkle Fieldhouse, still around today. Other students like Alexandrea Schlafer, a first year English major, said she could understand the reasoning behind the modern look of the new furniture. “Considering its status as a historical building, it’s nice to see they’re trying to modernize however they can,” Schlafer said, referring to Jordan’s spot on the National Registry of Historic Places. Butler community members can now use the new furniture which is prominently featured on the top two floors of Jordan Hall.